Good evening, we are the Council of Angels, Archangel Metatron, Archangel Michael and Archangel Raphael. We wish to speak to you this evening of the Raising of Your Frequency to match the higher vibrational frequency energies locking into your dear mother earth gaia’s crystalline grid within her etheric body and the higher dimensional energies now surrounding your planet, your higher selves, and all beings. These energies have been slowly and lovingly infiltrating your awareness, your planet, and your etheric bodies and all aspects of your Selves now for quite some time, slowly so that you would have time to adjust your selves to these beautiful higher dimensional energies which have been uplifting you into a most loving and beautiful consciousness and awareness of All That Is. The “lightworkers” among you are indeed quite sensitive to these energies which have been awakening within you the rememberance of your pre-birth contracts, agreements, and missions to assist the beloved mother earth and humanity during this great time of mass awakening on your planet. These energies, then, have been awakening within you the sequential codes to align yourselves with these higher vibrational energies so that you may be the wayshowers, the lightbearers, the lightholders, the telecommunicators from our realm to yours. We in the higher realms love you most dearly and are welcoming you with great love and light into the higher dimensional frequencies, on your journey homeward toward the source of all Love and Light. You are on your pathway home, and the higher you “climb” in consciousness, the closer you become to source. All of your have been raising your vibrational frequencies, some intentionally, some not so intentionally, some through “osmosis” and contact with other lightworkers, and yes you see you are all becoming One and part of this new Unity Consciousness which you are becoming very aware of, so then the raising of your vibrational frequencies then becomes an “en masse” project or happening, towards the escalation of your conscious awareness of these higher energies and these higher dimensions. We have been speaking with many of you light beings on earth, you who are the bringers and you who are ushering in the new Age and the new Dawn upon your now ever-healing and ever-ascending mother earth Gaia who is a most loving and caring sentient being, and who exists in service to all of humanity of the outer earth and of the inner earth; she exists to lovingly provide your earthen home. Dear mother earth’s consciousness is also ascending into the higher dimensional frequencies, just as you All Are. Her consciousness rises along with yours, and yours along with hers. We have spoken of the reverence we in the higher dimensions have towards this dear soul which you are all becoming aware of, and in this new Age which is dawning on the horizon, you are all of the intent to treat Her most lovingly. This loving intent towards your planetary home is part of the many aspects of the raising of your vibrational consciousness …..this raising of your vibrational frequency, then, is being obtained and realized in many ways….through your AWARENESS, your INTENT, your GROUP SOUL’S PURPOSE, your LOVING ENERGY, and most fo all, for each one of you, the CONNECTION TO YOUR HIGHER SELF and henceforth the connection with your higher dimensional Oversoul. This new Age upon earth is a time when all beings are “ascending” which is simply a raising of your vibrational frequencies, which also occurs when you are connected to your HIGHER SELF. 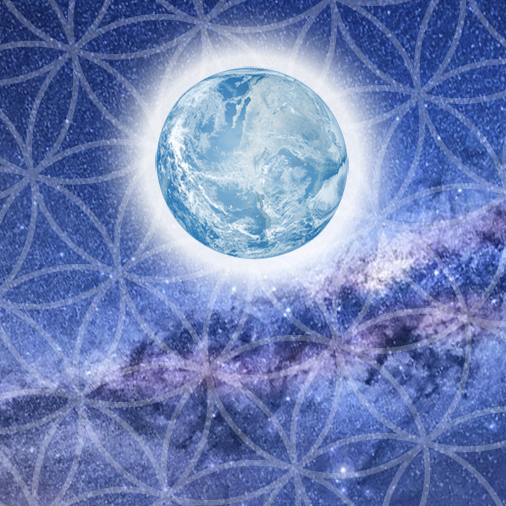 The connection with the higher self is an integral part of your individual and collective ascension, and this, then, creates a most magnificent 5th dimensional “web” or “grid” of cosmic light that forms your Group OVERSOUL; YOU ARE ALL BECOMING CONNECTED TO FIRST YOUR INDIVIDUAL HIGHER SELVES, and then, like a brilliant domino effect, all of your individual higher selves then become connected together into this BEAUTIFUL GOLDEN LIGHT-FILLED NETWORK OF HIGHER DIMENSIONAL CONSCIOUSNESS. This Higher Dimensional Consciousness is what you will be connecting into for the formation of your Higher Councils of the New Earth. For the term “government” is an old-world concept that is falling by the wayside; your new world consists of these higher dimensionally-connected Higher Councils in a most lovingly organized way. Your Councils will know how to connect into this Higher Consciousness Grid or Network, and all words, thoughts, actions, and manifestations coming forth from these lovingly-guided councils will be of the utmost respect for all life and all beings, and will be of the Highest Good for All. The All includes all living beings upon and inside your planet, around your planet, and of those higher beings who are assisting your planet at this time including We your Angelic Councils of Light who most lovingly and dearly are assisting in guiding you and transforming your world into this most beautiful new Creation. We leave you then with a simple visualization and meditation: that of the raising of your frequency to match the higher dimensional frequencies within your world now; the connecting of each of you with your Higher Self through intentional awareness and practice; and the natural progression then of each of your higher selves then connecting with each other in a beautiful golden-light filled network of Higher Dimensional Consciousness ~ this beautiful light-filled network is Full of the Source Energies of Love Light and Harmonious Creation. This light-filled network is also an echo or mirror of the light-filled higher dimensional frequency crystalline grid within your beautiful planetary being of mother earth/gaia….. so that her light-filled body then, is anchoring in these higher dimensional energies, and YOUR light-filled bodies are also anchoring in these higher dimensional frequencies by absorbing this beautiful higher dimensional light from mother earth below, and then bringing in the Creator Source energy into your bodies via your Individual Higher Selves, your Collective Higher Dimensional Oversoul, and the most Highest of All Energies Love and Creation, the Source of All. We suggest most highly that all will meditate upon these beautiful light-filled concepts and visualizations which are in fact existing in the multidimensional NOW; your awareness, and consciously loving intentions are now connecting you into this beautiful higher dimensional frequency pattern; this, then, facilitates your “ascension” into these higher dimensional frequencies and light networks of higher selves and higher dimensional oversoul; this raising of your vibrational frequency to synchronize, harmonize and merge into these higher dimensional energetic frequencies. With the softest love and light, we love you all most dearly and are ever near for you to call on for assistance with the Awakening of your Being. ©2012 The Golden Light Channel. All rights reserved. Please quote original source as www.thegoldenlightchannel.com, include this credit, do not alter it in any way, and provide the channel credit and link to www.thegoldenlightchannel.com at the top of the post.